Plastics are a type of resin that can be easily molded and are often used as a cheap, durable packaging material. There are six major varieties of plastics commonly in use. Some plastic items are made of a mixture of different resins. High-density polyethylene, also known as HDPE, is a strong plastic used to make jugs and bottles for short-term storage. To determine if a container is made form HDPE, look for a number 2 inside the three-arrow recycling symbol. HDPE is an abbreviation for high-density polyethylene resin and is used to make plastic storage containers for milk and detergents. Plastic containers are numerically coded to identify the type of resin they contain. There are six types of plastic plus a seventh category for other plastics that are made of a combination of different resins. Plastic containers are marked with a number 1 through 7 to correspond to the material they are made of. Plastic containers must be sorted according to their identifying number to be used for recycling. The number 1 coded plastic is PET or PETE, which is short for polyethylene terephthalate. Number 1 containers are clear and commonly used in packaging water, salad dressings, ketchup and soda. These types of bottles are often recycled to make fleece items and carpet. HDPE is high-density polyethylene and the number 2 plastic. It is sturdier than number 1 plastic and may be opaque and made in different colors. The number 3 plastic is PVC or polyvinyl chloride. Hoses, shower curtains and vinyl flooring contain PVC and typically can’t be recycled. Number 4, low-density polyethylene (LDPE), is used to make plastic food wrap and diapers and is not generally recycled. Polypropylene is coded as number 5 and is a hard plastic used for long-term food storage containers. It is also used to make pipes for plumbing. The last type of plastic is number 6, polystyrene. This foam-type material is used in egg cartons and disposable coffee cups and can’t be recycled. HDPE is the number 2 plastic. It is sturdy and commonly used in jugs for milk or laundry detergent and bleach bottles. Its toughness makes it difficult to tear and helps it resist bursting. It can be made translucent or opaque. Colored HDPE containers tend to have greater strength than see-through bottles and jugs made from HDPE. The opaque, colored plastic resists cracking or corrosion, which makes it a good receptacle for detergents and household cleaners. 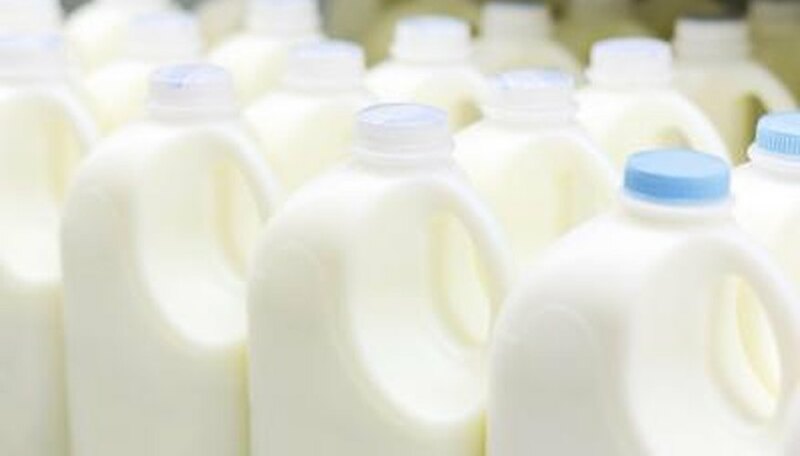 It is a food-grade plastic that is safe for storing perishable goods such as milk, but it is not designed for long-term food storage. It is difficult to remove odors and residues from high-density polyethylene. HDPE is relatively inexpensive to make and can be easily recycled. Recycled HDPE plastic is used to make many products such as toys, soda bottles, trash cans, traffic cones and plastic “lumber” for decks and outdoor furniture. HDPE is a type of polyethylene that is made from the natural gas ethane. When ethane is heated to 1500 degrees Fahrenheit, the molecules break apart. One of the new molecules formed is ethylene. Ethylene is a gas that becomes a resin during the process of polymerization. A polymer is a chain of molecules that forms as a product of chemical reactions involving catalysts and pressure. When ethylene molecules are polymerized, they produce polyethylene. Polyethylene – and other types of plastic – can be modified to enhance certain desired characteristics, such as flexibility, strength or imperviousness to a particular substance. Polyethylene can be made into different types of plastics: Low-density polyethylene, or LDPE, and polyethylene terephthalate, also known as PET or PETE. Utah State University Extension: Which Plastics Are Safe for Food Storage? Mentzer, A.P.. "What Is HDPE Plastic?" Sciencing, https://sciencing.com/hdpe-plastic-5839257.html. 22 October 2018.